Data from Verburg, PH, Ellis, EC, Letourneau, A. 2011. 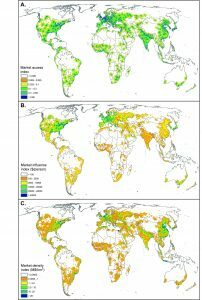 A global assessment of market accessibility and market influence for global environmental change studies. Environmental Research Letters 6: 034019. Markets influence the global patterns of urbanization, deforestation, agriculture and other land use systems. 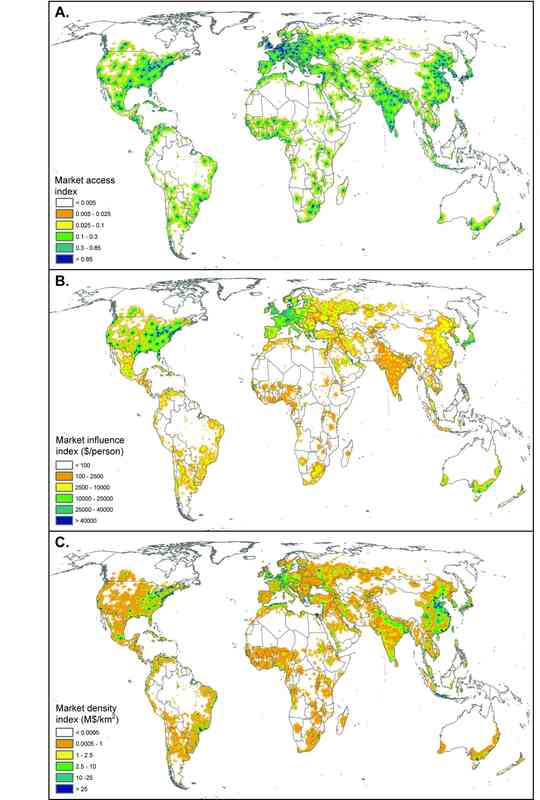 Here we present a high spatial resolution gridded data depicting market influence globally. The data jointly represent variations in both market strength and accessibility based on three market influence indices derived from an index of accessibility to market locations and national-level gross domestic product (purchasing power parity). These indices show strong correspondence with human population density while also revealing several distinct and useful relationships with other global environmental patterns. As market influence grows, the need for high resolution global data on market influence and its dynamics will become increasingly important to understanding and forecasting global environmental change. The dataset contains 3 indices: first, an index of access to national and international markets was calculated, and second, two indices of market influence, one by combining national GDP data directly with the access index, and the other by downscaling national GDP using a measure of economic density. For more information contact Peter Verburg.